Ford EcoSport Sales Drop By 50% In November 2018; Nexon The Reason? Home Cars News Ford EcoSport Sales Drop By 50% In November 2018; Nexon The Reason? Ford India Private Limited finally turned profit after more than twenty years since entering the domestic market reportedly in the last financial year and in July 2018 celebrated one million customer milestone. The American auto giant has been using India as a test bed in its Emerging Market Operating Model (EMOM) as it embarks on cutting costs where necessary and getting involved in local JVs, platform sharing, etc. Several reports suggested that the EMOM plan has helped Ford to grow its business from $2.1 billion in 2015-16 to $2.8 billion in 2016-17 and $3.4 billion in 2017-18 in India. Ford’s partnership with Mahindra carries plenty of significance as both brands are exploring synergies with mutual benefits. The largest UV maker in the country will be supplying a small capacity petrol engine to Ford as part of a new agreement. Moreover, a jointly developed mid-size SUV is in the horizon in the coming years. Mahindra has been assisting Ford in more market penetration in India. Resultantly, Mahindra dealers are selling Ford EcoSport, Figo and Aspire in about 15 towns across the country. In November 2018, Ford posted 18 percent YoY sales decline with total sales of 6,375 units against 7,777 in the same month last year. With 2.4 percent market share, Ford is positioned seventh among manufacturers in domestic volumes. 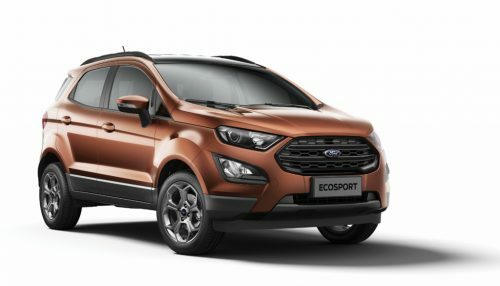 Ford has the EcoSport SUV as its top seller for several months in the Indian market and last month only 2,724 units were retailed at a de-growth of 50 percent. The subcompact SUV segment has seen increased competitors in recent years as the arrival of Tata Nexon did shake up the proceedings following Maruti Suzuki Vitara Brezza’s entry to become the best-selling SUV in India. The EcoSport will have another rival in the form of Mahindra S201 in early 2019 with several first-in-class features and possibly most powerful petrol and diesel engines in the segment. We expect the EcoSport’s sales to increase in the coming months due to the pilot project that will see more penetration for the brand courtesy of Mahindra. It has been given a go in 15 Tier 4 cities where Mahindra dealers will retail and sell Ford’s vehicles.